The Fantastic Fifties Special Edition #2 - Giant Monsters! 80 pgs BACK IN STOCK! 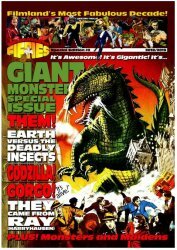 MyMovieMonsters.com > Monster Magazine Marketplace > Fantastic Fifties (UK) > The Fantastic Fifties Special Edition #2 - Giant Monsters! 80 pgs BACK IN STOCK! HOT SELLER BACK IN STOCK! It's Awesome, It's Gigantic! It's ... Special Edition #2 of The Fantastic Fifties, featuring Giant Monsters. More pages than the standard editions of FF! Perfect bound, full-color glossy magazine. 80 pages plus cover. Special Edition #2 2018/2019. Hemlock Publishing. For mature readers.